Along with Piemonte, Toscana is the most significant region of Italy in terms of quality wine. The Tuscan hero, the Sangiovese grape variety, is a dark-berried vine which is virtually synonymous with the great red wines of Toscana and all the romanticism that goes with the territory. In the south-western coastal area of Toscana, called Maremma, the Sangiovese grape is called Morellino, a diminutive form of morello, which means ‘dark’. The name translates, then, as ‘little dark one’, an etymology almost identical to another of Sangiovese’s many synonyms, the world-famous Brunello from Montalcino. The Erik Banti winery is located in Scansano, renowned for its wine as long ago as the early 1800s when the Napoleonic army decided to make a garrison there for the troops marching to Rome, which was then governed by the Vatican. Here, the owner put a cork in his first bottle of Morellino in 1981. At the time Morellino di Scansano was a new and relatively unknown DOC and it was only consumed in damigiane (56-litre demijohn) by tourists visiting the splendid Maremma coastline. The first awards came very soon and the excellence of the Scansano grape had been established. 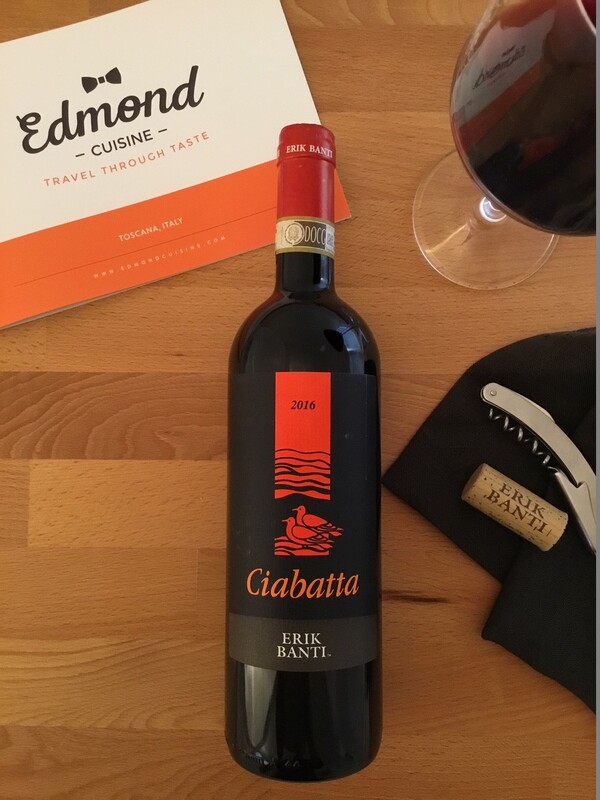 A blend of 85% Sangiovese, 10% Alicante and 5% Ciliegiolo, the Ciabatta wine has a beautiful bright ruby colour and an intense and persistent aroma, with hints of walnut husks and morello cherries. The passage in barrels leaves a pleasant vanilla undertone. The palate is dry, tangy and balanced, with a persistent, long finish. Aged for about a year in stainless steel vats and for 13 months in barriques and medium-sized Slavonian oak barrels. It pairs with roasted or grilled meat, game and wild boar in particular, as well as traditional Maremma dishes like stew and mature cheeses.